A few nights ago my husband and I had the opportunity to have dinner with a very old friend. We had not seen him in a very long time and during our time apart he had gotten married to a lovely doctor who brought to the marriage her beautiful daughter. A year and a half ago they had an adorable daughter of their own. His family is beautiful. He is very lucky! He invited us to meet his new family and, of course, we agreed. 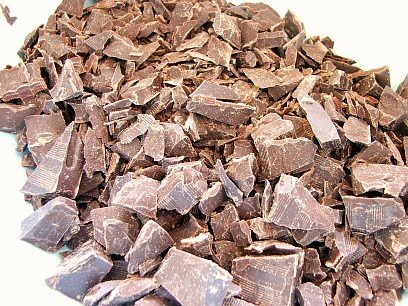 I asked what I could bring for dessert, as that is kind of my thing, and he said anything chocolate. SCORE! So, for the girls I made a batch of Cream Filled Cupcakes, and for the adults I made a Chocolate Glazed Chocolate Tart. 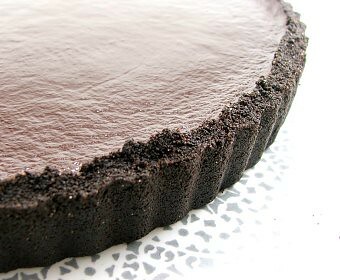 This tart is incredibly easy to make, it looks spectacular, tastes like chocolate heaven, and as our friend’s wife commented it would be the perfect canvas for experimenting with different flavors. We all agreed raspberry, orange, and mint would be lovely. 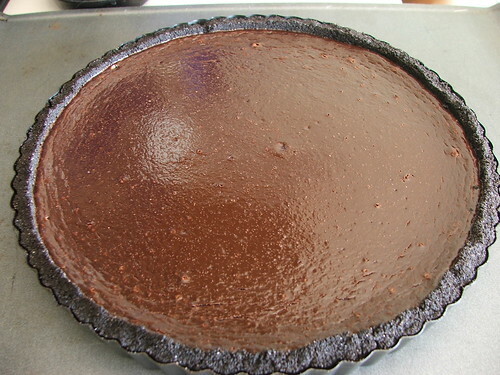 I also think some ground toasted hazelnuts in the filling would be nice for flavor and texture. I did make a few changes to the original recipe. I could not find the chocolate graham crackers, which I have seen before but not this visit to the store, so I used chocolate wafer cookies. Because they grind up finer than graham crackers I used more crumbs but I did not increase the butter. It did not need it. I also reduced the sugar because chocolate wafer cookies are quite sweet on their own. 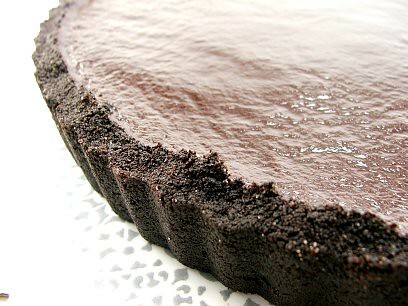 If you have someone you want to treat may I recommend this tart? It is divine! Bake at 350F for 10 minutes. Allow to cool while you prepare the filling. 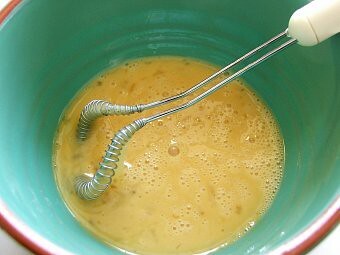 Heat the cream in a heavy pot over medium heat until it bubbles around the edges. 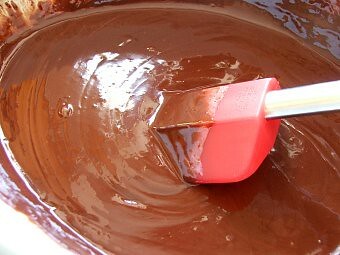 Pour it over the chopped chocolate and allow to sit for three minutes, then stir until it is well mixed and all the chocolate is melted. In a small bowl mix the egg and vanilla. 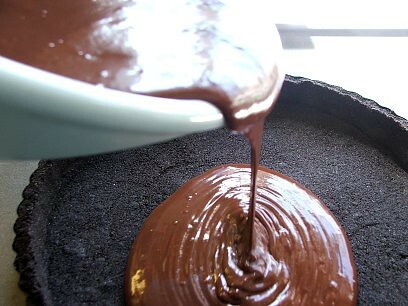 Pour it into the melted chocolate and mix well. Pour it into the prepared curst. Gently tap the tart to break any air bubbles. 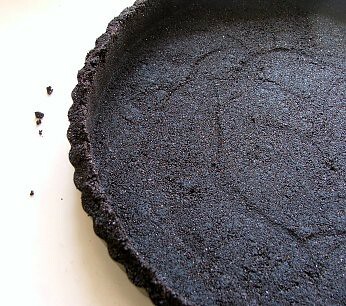 Place on a sheet pan and bake the tart for 20 minutes, or until the edges are just set and the center is still slightly wobbly. Allow to cool for an hour. As it cools make the glaze. 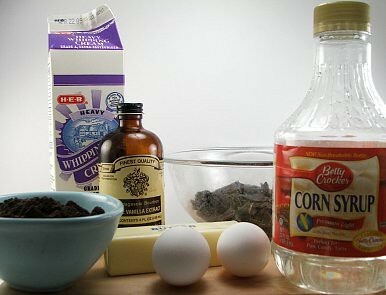 Heat the cream until it simmers and pour over the chocolate. Stir to melt, then add the corn syrup and water. Mix well. 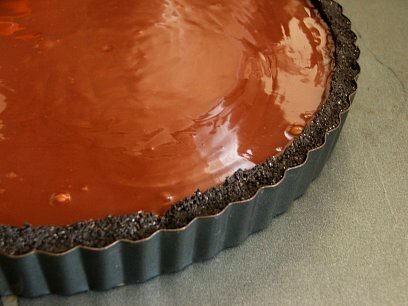 Pour over the cooled tart, and gently tilt the tart to spread the glaze to the edges. Let set for an hour at room temp before serving.